Documentarian Michael Moore finds little to say about Trump's rise to power that hasn't been stated better elsewhere. For more than 30 years, Michael Moore has been one of the loudest and most successful voices in American documentary filmmaking. That is not to say his work is always objective and without its own agenda, but films like Roger & Me and the Oscar-winning Bowling for Columbine changed the landscape for non-fiction films. No longer was the genre viewed as staid educational compilations of dry newsreel clips, but the documentary gained credibility as a viable art-form and source of entertainment - worth seeing on the big screen. All that said, Moore’s latest film arrives at a time when political satire dominates the mainstream. One need only look at the late night network talk shows to find the likes of Stephen Colbert, John Oliver and Seth Meyers eviscerating the current administration on a daily basis. Moore’s schtick is no longer unique, and it is not enough merely to point out that Trump is a spoilt former reality TV show host who won the presidency on a wave of bluster and empty promises. As a result, much of Fahrenheit 11/9 feels like well-worn territory. Exposing Trump as a racist and a misogynist, who cosies up to dictators while behaving incredibly creepily around his daughter Ivanka is old news. 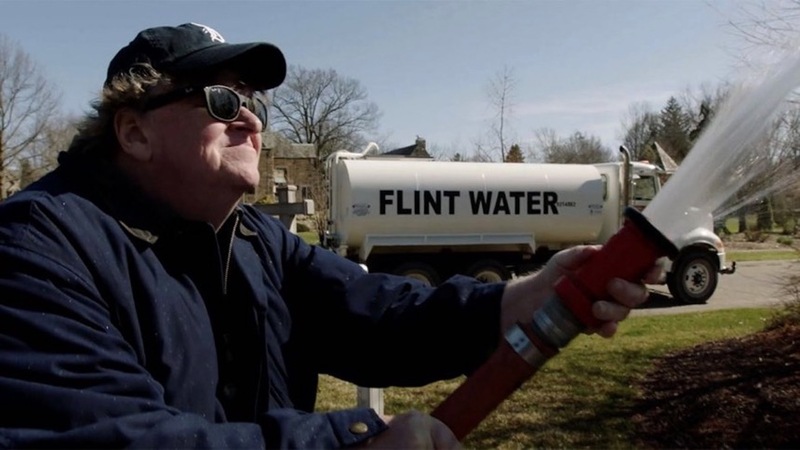 Thankfully, Moore fills the bulk of his film by revisiting a number of his favourite subjects, checking in on topics like gun control and the current state of his hometown of Flint, Michigan, to illustrate how far the country has fallen. Governor Rick Snyder, a former CEO with no prior public service experience, has taken a number of steps to privatise Flint’s water supply. By cutting off the supply from Lake Huron and forcing the population to drink from the hugely polluted Flint River, hundreds of reported cases of lead poisoning have surfaced as a result. Moore discovers that these results have been altered and covered up by the government, allowing one of the country’s poorest cities to fall into despair. The state of the area only gets worse when the US Army begin running full-scale training operations in the area. Moore also spends time with the students of Stoneman Douglas High School in Parkland, Florida, where a horrific mass shooting in February left 17 dead but galvanised a nationwide student protest on an unprecedented scale. Moore finds hope for the future in inspirational teenagers like Emma Gonzalez and Cameron Kasky, who led the March for our Lives demonstration, as well as emerging political candidates such as Alexandria Ocasio-Cortez, who are looking to upend the establishment. As ever, Moore’s biggest problem is that he is unable to get out of his own way and feels compelled to stage ridiculous stunts that are more attention-seeking and desperate than legitimately helpful or humorous. At one point, Moore uses a water truck of Flint River water to hose down Gov. Snyder’s home. Later, he shows up at Snyder’s office demanding to make a citizen’s arrest. Neither moment is particularly funny, nor does it appear to have even been noticed by its target. The film’s most interesting line of enquiry is into the Democratic party, and how a loss of faith convinced 100 million registered voters to stay away during the 2016 elections. Moore highlights how Bernie Sanders was deprived of a number of legitimate primary victories because the party had already decided to back Hilary Clinton and her more centrist, capitalist ideology. Had the film focused more on this narrative, Fahrenheit 11/9 may well have proved more compelling, rather than merely a diverting summary of well-worn talking points.